It’s Saturday, my favourite day of the week. It is sunny and warm , -1 Celsius at the moment. Maybe now the warmer temperatures will prevail. 2018 is the most difficult February I have experienced in a long while. Even being sunny and warm, I feels at odds with the day. I nixed swimming this morning, choosing not to doubt my lack of well being. Sheba is feeling the same. 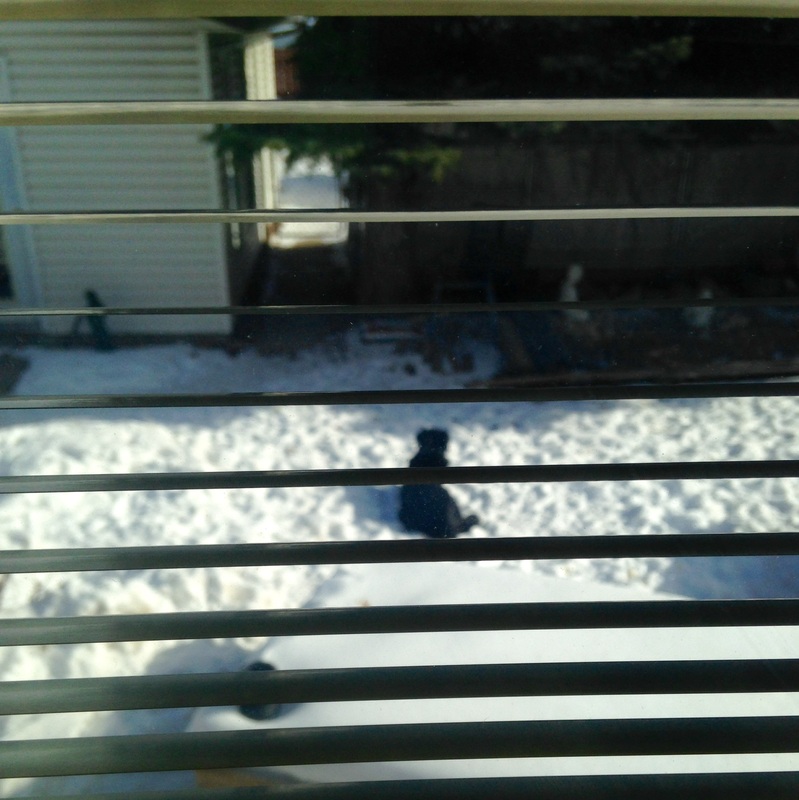 She is behaving out of character, choosing to lay out in the snow by herself for long periods. It could be that she’s miffed at me for cleaning her ears. Or else she’s got spring fever. It was worrisome that I couldn’t entice her in with a treat. But she looked relaxed. She is smart. She knows how to get back in. It’s nice to have some quiet time without her barking and fussing for attention. I can watch and listen to Caroline Myss. It has been difficult to find the time and the quiet. Today I’m watching the workshop on Self Esteem and the Power of Your Choices recorded in Sedonia, Arizona last February. She is such a good teacher. How serendipitous that she is coming out of a bad cold then as many of us here, including myself (though not so bad) are now. I feel at times embarrassed that I am so enthused of her teachings.They resonate with me. I have been listening to her for a long time. Today, I really understood the meaning of archetypes and their animation. I love learning – especially about life. I can’t help being a student. That archetype is in and alive in me. I can’t stop myself from listening to spiritual teachers. It is the same with the artist archetype in me. I’ve been talking about it for many, many years but have done nothing about it until now . The artist have finally came alive in the past year or so. Sometimes I can’t believe it myself. The paintings just came out of me – on their own it seems. Who am I to argue with them? They wanted to come out. It is their time. This is a powerful workshop and long consisting of 10 videos, each averaging an hour long. I’ve finished number 3. Now it is almost 6 pm. Time to close for the day. I’m glad that I’ve developed the habit of getting up and showing up – here to tap out my words, feelings, learning and taking Sheba out for her daily walk. Sometimes Often I don’t want to but the established habit/routine enables me to carry through. Today I’ve learned of habits of the heart/soul, Habitus Maximus. They’re the ones that will help me to a congruent person. There’s so much to learn. It is exciting. This entry was posted in Uncategorized and tagged animation, archetypes, artist, Caroline Myss, habits, life, Saturday, Self esteem and the power of your choices, student, workshop, writing. Bookmark the permalink.